The Kansas African Studies Center (KASC) is one of the Area Study Centers within the framework of International Programs of the University of Kansas. The KASC is an independent unit of the College of Liberal Arts and Sciences (CLAS) operating with a director, staff, and offices, and it maintains direct and dynamic links with the African and African-American Studies (AAAS) Department. The KASC promotes the study and understanding of Africa in the state, the region, and the country, and it coordinates and develops the interdisciplinary interests of Africanists across the University of Kansas. Its mission includes the sponsorship of research, teacher training, and curriculum development, the organization of conferences, the promotion of special projects, the acquisition of library and related resources, the conduct of outreach programs and opportunities, and the seeking and acquisition of grants and special funding to make these activities possible and to assist the university in their realization. 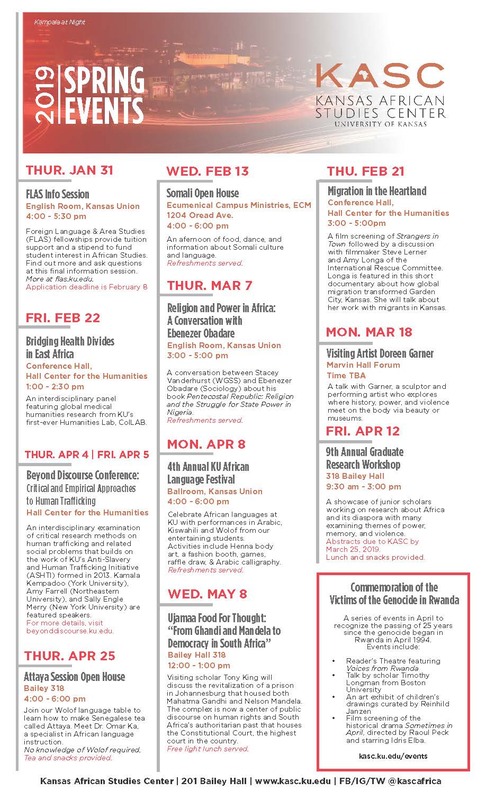 The African Studies Council includes faculty, administrative staff, and students at the University of Kansas with strong interest and active participation in African area studies. Demonstrated interest and participation include attendance at KASC activities and professional conferences, teaching Africa-related courses, conducting research on Africa-related issues, and/or knowledge of an African language. The Council is responsible, in conjunction with the Executive Committee, for maintaining a list of active and prospective Council members. The Council functions in an advisory capacity to the Executive Committee. The Council is responsible for electing five at-large members to the Executive Committee. All faculty, graduate students, and administrative staff who are in attendance at Council meetings may vote. All interested undergraduate students may attend, but only two undergraduate representatives, chosen by their peers, may vote. The Council ordinarily meets once each year, normally in late Spring. Special meetings are called whenever necessary. As the representatives of the Council, the Executive Committee meets at least once each semester and functions as the major policy-formulating body for the KASC's activities. At large members serve a term of two years and are elected by the Council. Nominations for at-large membership on the Executive Committee are made by members of the African Studies Council at the request of the Executive Committee. After an appropriate number of nominations are secured, the Executive Committee prepares a ballot and distributes it at the Spring Council meeting, where an election is held for terms that begin the following academic year. Normally, the Director of the KASC is responsible for calling and presiding over meetings of the Executive Committee and the African Studies Council. Motions for amendments or revisions to the By-Laws may be entertained by or recommended to the Executive Committee, but all changes in the By-Laws must be approved by a two-thirds vote of the African Studies Council.